Educating the un-educated and skilling the un-skilled is one of the primary objective of Niveda Foundationâ€™s existence. We are committed to ensure that maximum children are covered under our education programs. 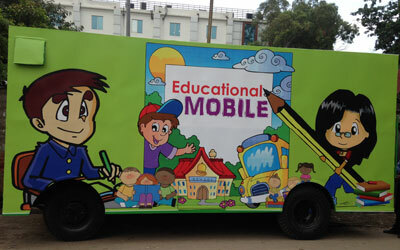 Niveda Foundation launched an Educational Mobile School in the slum cluster of Sector 9 and Sector 10 Noida. The Show was inaugurated by Shri NP Singh, District Magistrate Gautam Budh Nagar, on 15th August 2016.The project is sponsored and Supported by Gautam Budh Society. Under this project Niveda is giving free education via Mobile Van. Around 64 students of the slum basti of sector 9 and 10 of Noida get benefit with this initiative with every new session. These students will be educated and groomed for six months and further the students would be sent for Formal Schooling. Niveda launched its first IT Learning Centre under ABAS, on 24/08/2015 at GD Colony, Mayur Vihar Phase 3, Delhi. This was a Youth Skilling project, under which 120 youth would be trained and groomed for placement. Niveda Foundation inaugurated its Stitching centre at GD Colony, Mayur Vihar Phase 3 on 9/07/16.The centre was inaugurated by DM of Gautam Budh Nagar, Mr.NP Singh. Thanks to Navrathan Foundation for partnering with Niveda Foundation in this project of empowering and training the underprivileged girls and women. Anguthe se Kalam Tak is one of the many initiatives that we take up to promote adult education among un-reached sections of our society. These camps were organized at following locations.